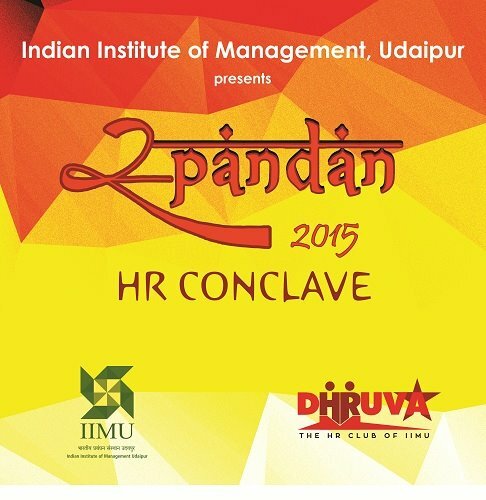 Indian Institute of Management, Udaipur will be hosting the third edition of its annual HR Conclave: Spandan 2015 on 20th June, 2015. 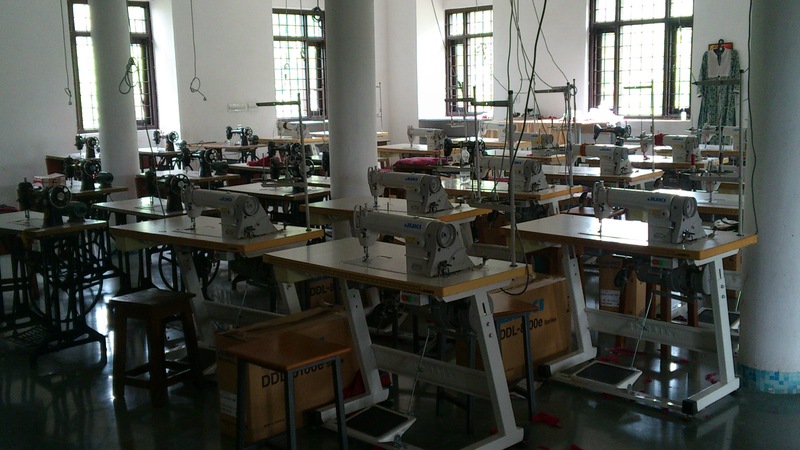 It is being organized by the HR club of the institute – dHRuva. The conclave aims to be a platform for global HR leaders to share their expertise and experiences in the ever-changing fields. The umbrella theme of the conclave, Connect will focus on deliberating the ever evolving roles and responsibilities of the HR function and discuss how connecting it with the mainstream functions is the need of the hour for successful and strategic functioning of the organizations. As part of the event, there would be two panels. 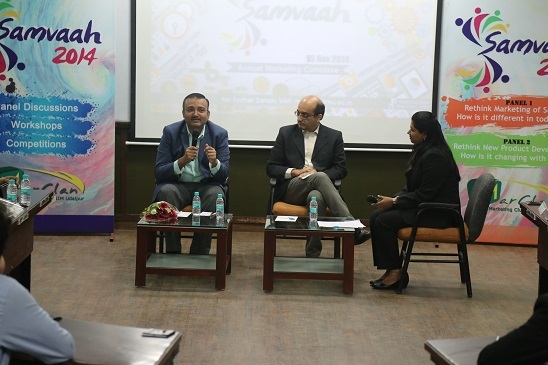 The first panel would have a discussion on ‘How to connect creativity with profession’ and the role of HR in fostering innovation in organizations. The second panel discussion would be on connecting to mainstream and the role of HR as a strategic partner in businesses. 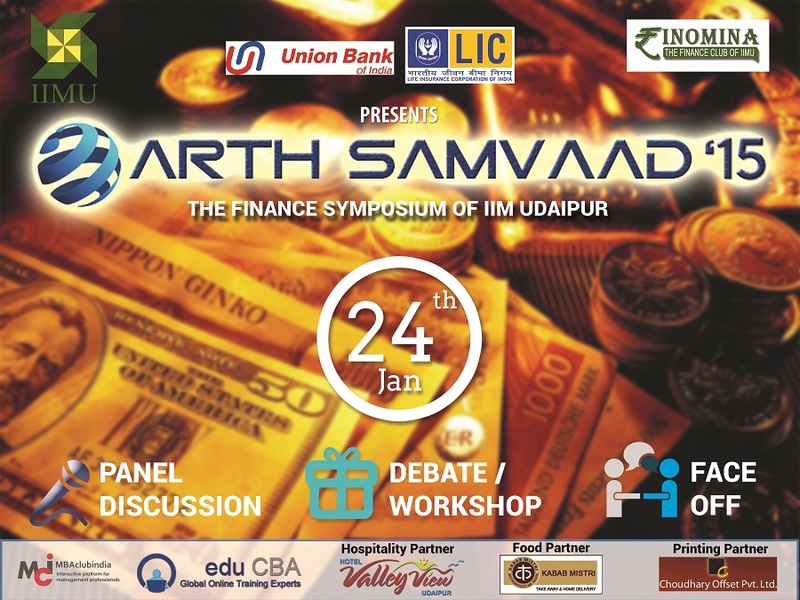 The event will start at 2:00 p.m. in the afternoon and will end at 6:05 p.m.
Indian Institute of Management, Udaipur in association with the Harvard Business School Club of India successfully organized the first Inclusive India Forum 2014 at IIM Udaipur campus on 26th July, 2014. 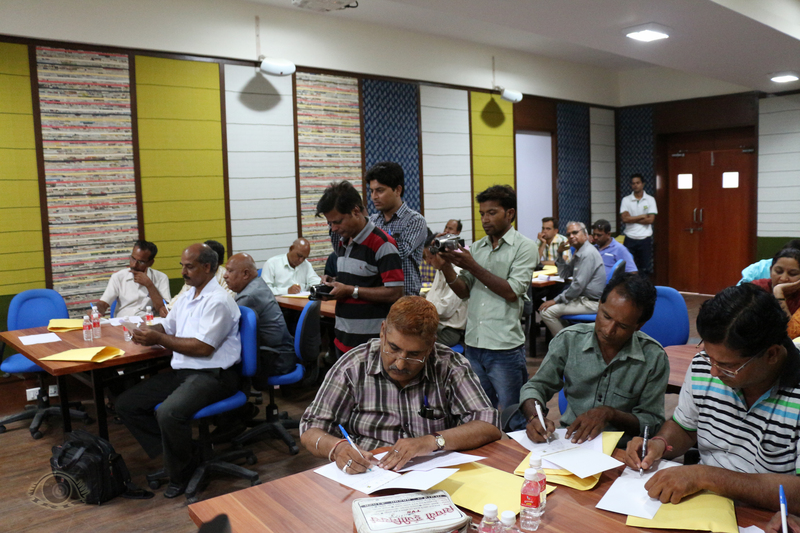 The event was attended by stalwarts from corporate and social sectors. 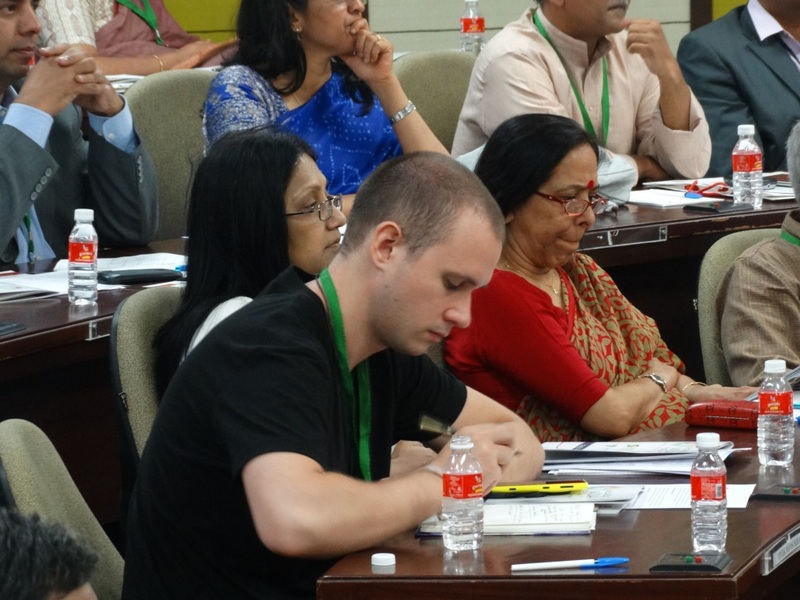 Prominent delegates included 12 Harvard Business School Alumni, 23 Corporate Social Responsibility Heads from various companies and 44 Founders & Senior Functionaries from NGOs from across India. 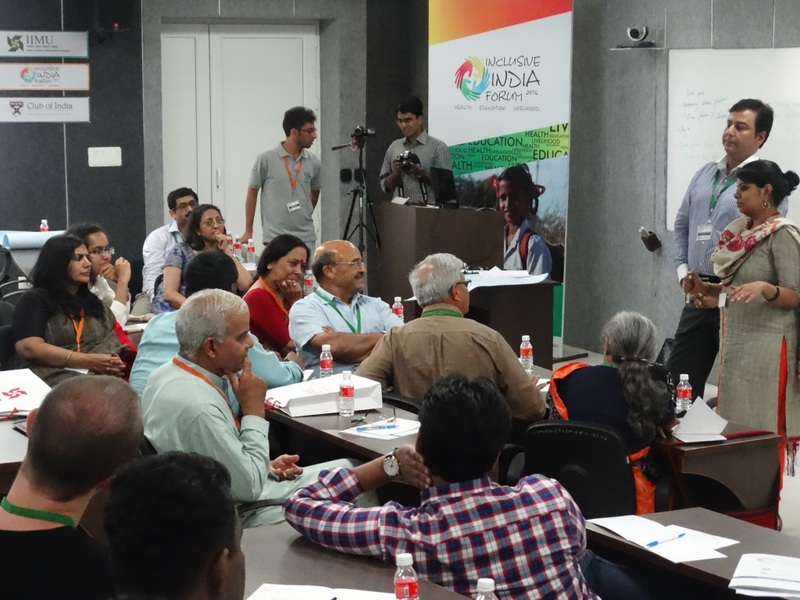 Inclusive India Forum is the first event of its kind organized in India, where different stakeholders from corporate organizations and NGOs shared one platform to discuss ways in which partnerships can be created in the development management space for the larger benefit of society. 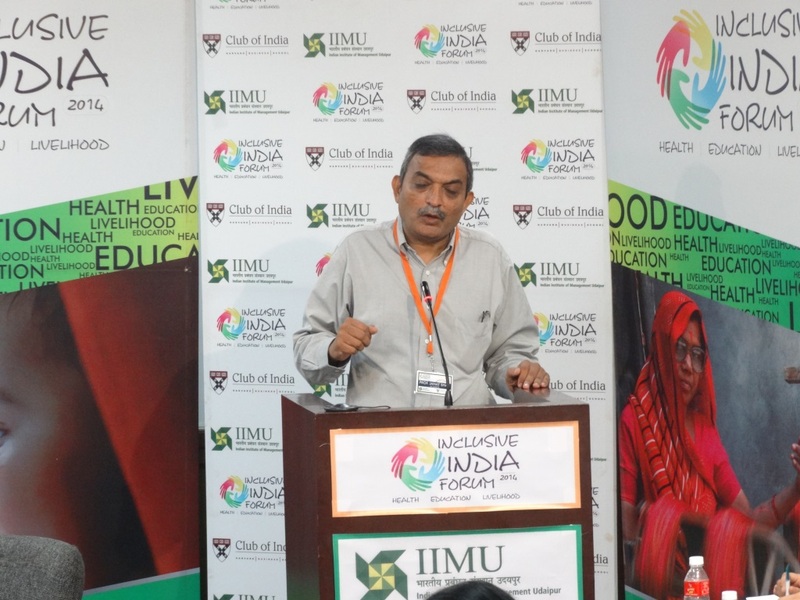 The event began with a welcome address by Prof. Janat Shah – Director, IIM Udaipur. Dr. Shah mentioned the need to focus on the development in the region. He specified the deep commitment of IIM Udaipur to work towards this agenda citing many initiatives like the Center for Development Management, partnerships with local corporates and NGOs like Hindustan Zinc, Secure Meters, Seva Mandir, Arth and Aajeevika Bureau among others. His speech concluded with the purpose of the event to devise an action plan through the collaboration and discussions with the delegates and to make dependable friends who will join IIMU in working towards the inclusive growth of India. The keynote address for the event was delivered by Dr. Ganesh Natarajan, Vice Chairman & CEO, Zensar Technologies and Chairman of the 2000 member strong NASSCOM foundation. He talked about his initiative which aims at making at least one member of every Indian family digitally literate, so that the access to technology and the corresponding awareness can help them avail the development initiatives. He emphasized that the vision of HBS Club of India should be contributing in the field of social causes and not that of a mere business beneficiary body. The participation of the delegates for the day began with first panel discussion on “The Corporate World on the Social Sector” which was moderated by Dr. Ganesh Natarajan. The panelists Prof. Janat Shah, Mr. S. Ravichandran – Cummins India, Ms. Neera Nundy – Dasra and Mr. Sanjaya Singhal – Secure Meters spoke largely on the topic and the audience participation brought in key pointers like lack of need-gap analysis of planning/scalability skills in NGOs, absence of CSR initiatives taken by companies in non-industrialized regions of India, strategic alignment with corporate organizations and executional challenges of incorporating CSR values in corporations. Second panel discussion on the theme “Development Management Sector in India: What works and what does not?” was moderated by Mr. Anshul Arora, CEO – Edvance Group and saw Mr. Aditya Nataraj – Piramal Foundation, Mr. Ajay Mehta – Seva Mandir, Ms. Rita Soni – NASSCOM, Mr. Anoop Kaul – Basix, Ms. Uma Ganesh and Mr. Jayant Sahastrabuddhe discussing on existing as well as future possible partnerships between civil society, NGOs and corporates. The challenges like experimental flexibility in schemes such as NREGA by the government, importance of knowledge creation and knowledge asymmetry were discussed. The common opinion which emerged was that educational institutions should focus on making social leaders, and bring about capacity and capabilities building along with partnering with local industries to work towards nation building. 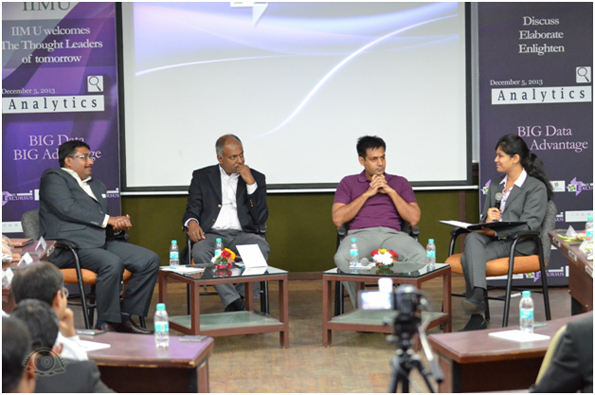 The message of ‘CSR as a fundamental duty of everyone’ was emphasized by the panel. 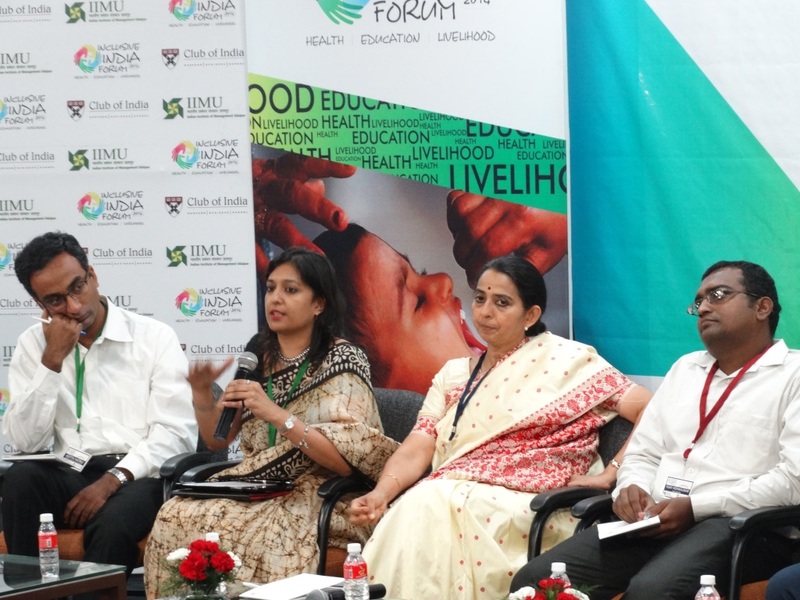 The panel discussions were followed with brainstorming sessions wherein delegates segregated into three focus groups to discuss on current and possible future initiatives in Livelihood, Healthcare and Education sectors. 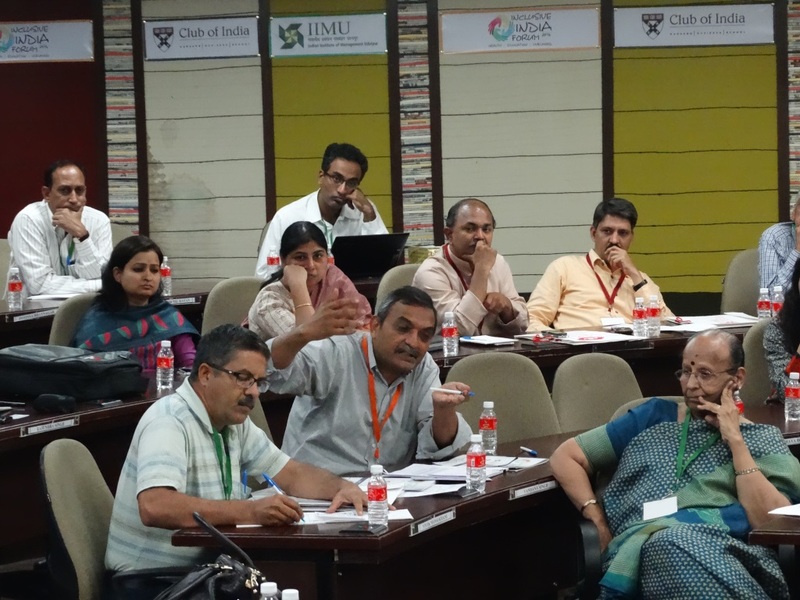 The mutual discussions between corporate, CSR representatives and social sector heads in common teams brought perspectives on formulating roadmaps to give directions for future collaboration on social projects. The implementation challenges at the grass root level and the deep understanding of the bottom of the pyramid brought in by the NGOs helped in developing of a complete functional roadmap. 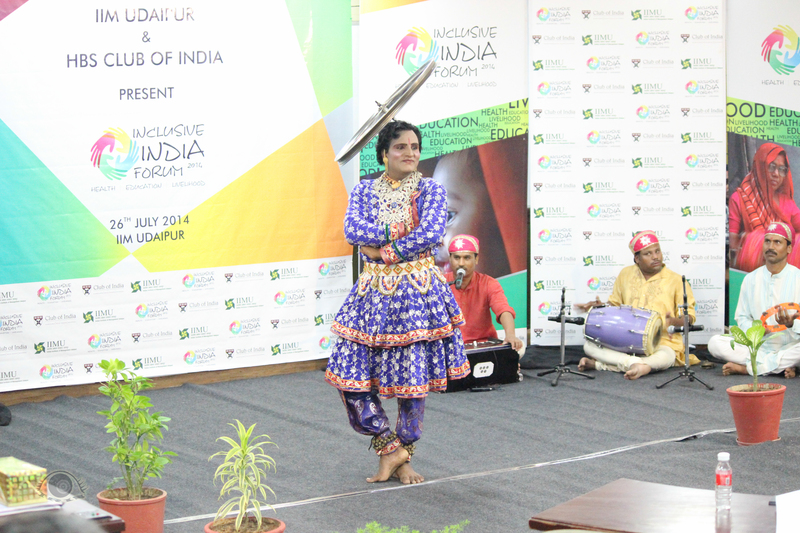 The event saw enthusiastic response and the participants were enthralled with a cultural program in the evening with highlights of traditions of Rajasthan. 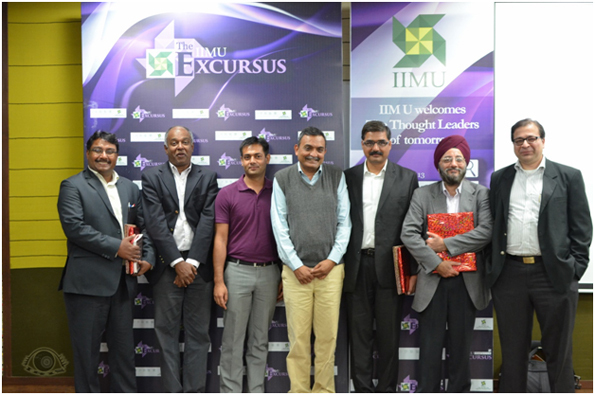 The delegates also had interactions with the student community of IIMU and partake a Heritage walk and NGO visit on 27th July, 2014. Indian Institute of Management Udaipur strives to build a workforce of student managers imbibed with the beliefs of social responsibility, inclusiveness and the potential of collective growth, who can go on to create social and economic values for the society. 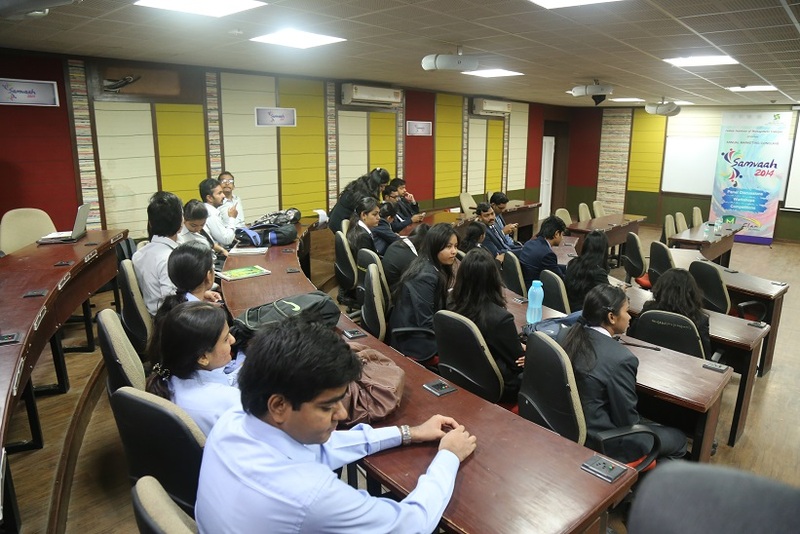 This initiative organized by Prayatna – The Social Responsibility Club of IIM Udaipur represents the true pride and insignia of IIMU and is a key milestone achieved in this direction. 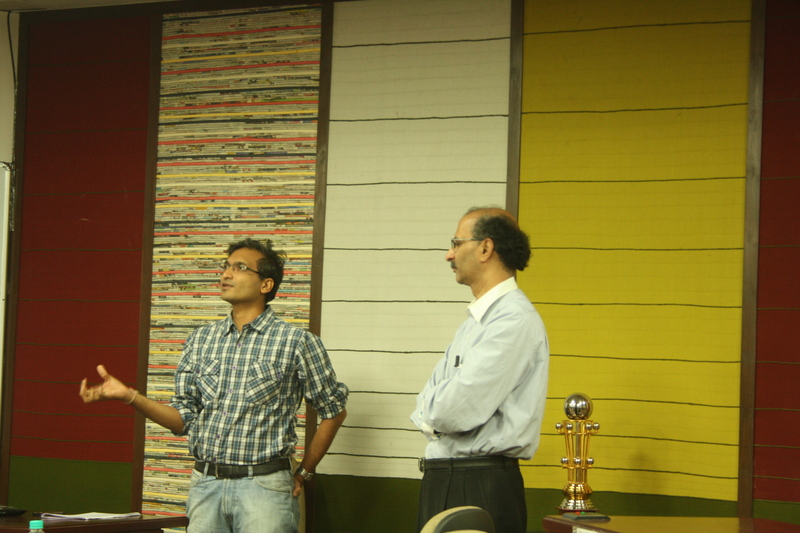 IRIS – The Photography Club of IIM Udaipur helped in clicking the pictures of the event. 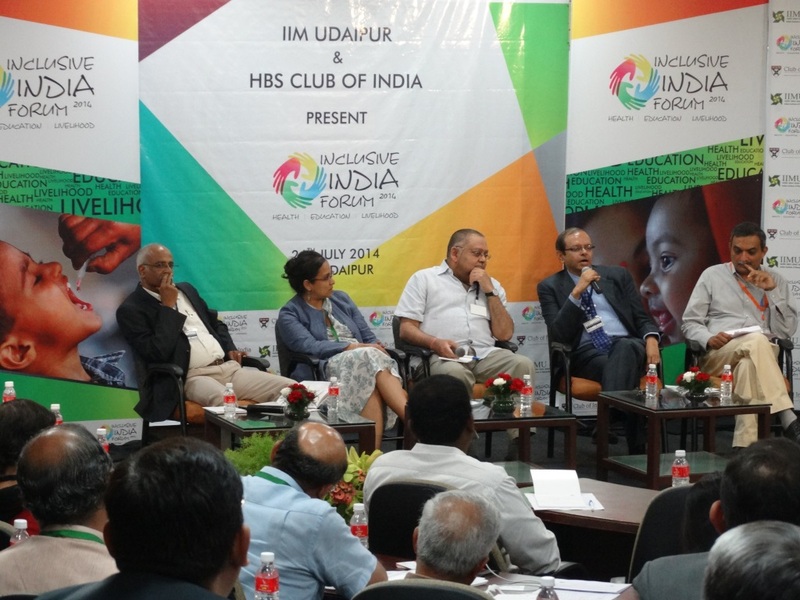 Indian Institute of Management, Udaipur in association with the Harvard Business School Club of India will host the first Inclusive India Forum on 26th July, 2014 at IIM Udaipur campus. Inclusive India Forum will be attended by stalwarts from corporate and social sectors. Confirmed delegates include 25 Harvard Business School Alumni, 25 Corporate Social Responsibility Heads from various companies and Founders & Senior Functionaries of 40 NGOs from across India. Inclusive India Forum would be the first event of its kind organized in India, where different stakeholders from corporate organizations and NGOs would gather on one platform and discuss ways in which partnerships can be created in the development management space for the larger benefit of society. 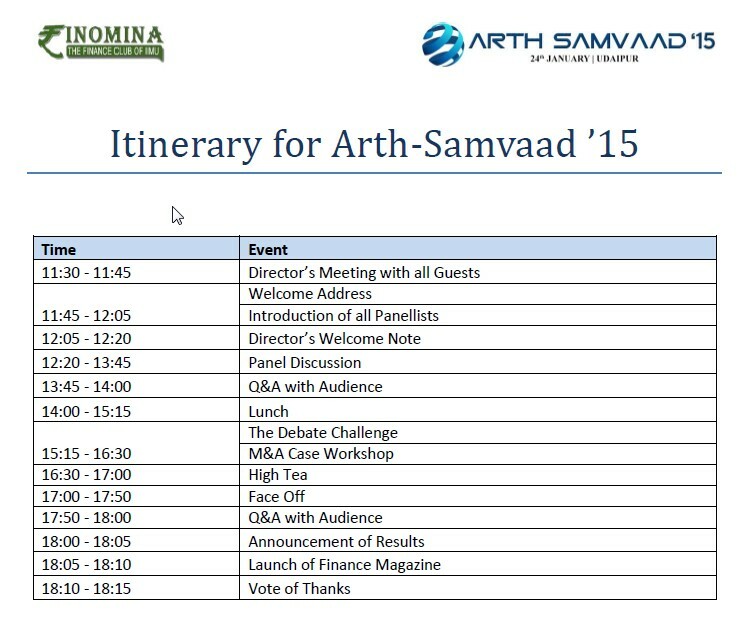 Janat Shah, Director – IIM Udaipur, faculty and students of IIMU will welcome all the delegates in the event. The event will flag off by a Keynote address to be delivered by Dr. Ganesh Natarajan, Vice Chairman & CEO, Zensar Technologies. C-Suite Executives from some of the big firms across the country including Brookings India, Dr. Reddy Foundation, BP India, DLF, Vodafone, Piramal Foundation, Forbes Marshall, Genpact, Vedanta, Hindustan Zinc, Max India Foundation, ITC, MacArthur Foundation, NASSCOM Foundation, Secure, Shell Foundation and Harvard Business School alumni would unite together to deliberate on how the skills and resources from Corporate world can align with the Social services sector to develop synergies across various projects in the social space in the coming years. The forum brings together personalities and leaders from NGOs like ACCESS Development Services, Akshaya Patra Foundation, Ananya Finance, Arth, Astha Sansthan, BASIX, British Council, Cecoedecon, Centre for Science and Environment, Concern India, Drishtee, EDVANCE Group, Food Security Foundation India, IBTADA, IIMPACT, Jatan, Lok Panchayat, Marie Stopes International, Pan Himalaya Grassroot, Piramal Foundation, Secure Giving, Seva Mandir, Shaishav, Smile Foundation, Uthan, VAAGDHARA, VANI and Vidya Bhavan Society. 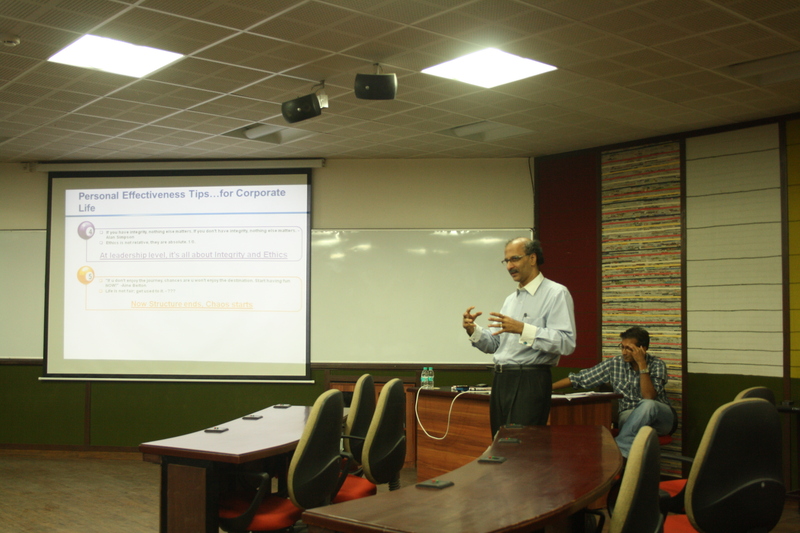 The first panel discussion on “The Corporate World on the Social Sector” would be moderated by Dr. Ganesh Natarajan. This would be followed by second panel discussion on the theme “Development Management Sector in India: What works and what does not?” moderated by Mr. Anshul Arora, CEO – Edvance Group. The panel discussions will be followed by brainstorming sessions wherein delegates would be segregated into three focus groups and would discuss on current and possible future initiatives in Livelihood, Healthcare and Education sectors. One of the key anticipated outcomes of the forum is a roadmap which will give directions and indicators for working in a collaborative way on social projects in future, which would lead to inclusive growth in India in the long run. 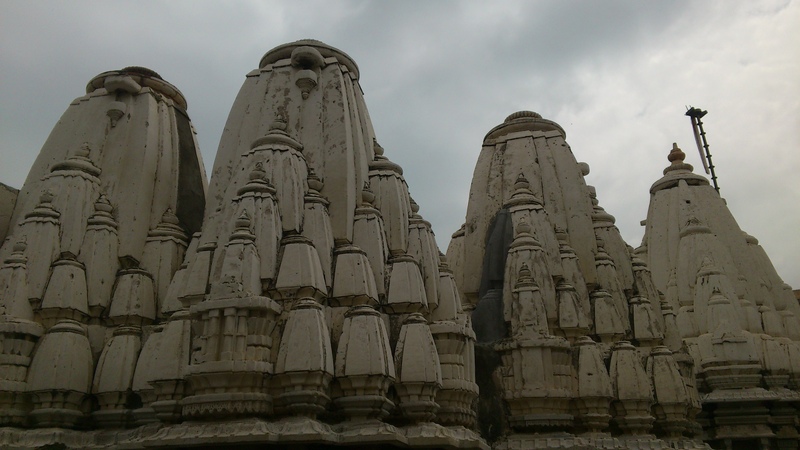 The Udaipur community has shown keen enthusiasm and interest in this event. 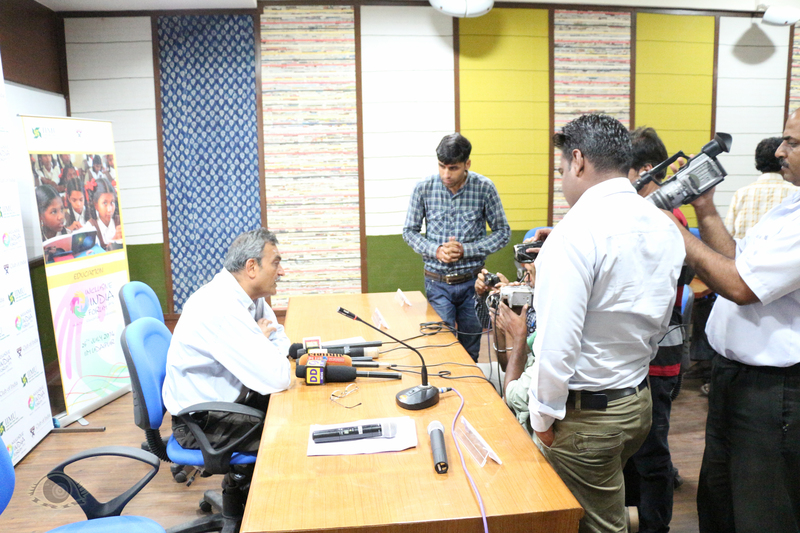 A Press Conference was conducted on 23rd July in IIM Udaipur campus as a pre-cursor for this event in which around 30 local press and media partners came to cover the event. Zucchini Italian Cuisine Restaurant of Udaipur has associated with the forum as the Food Partner. 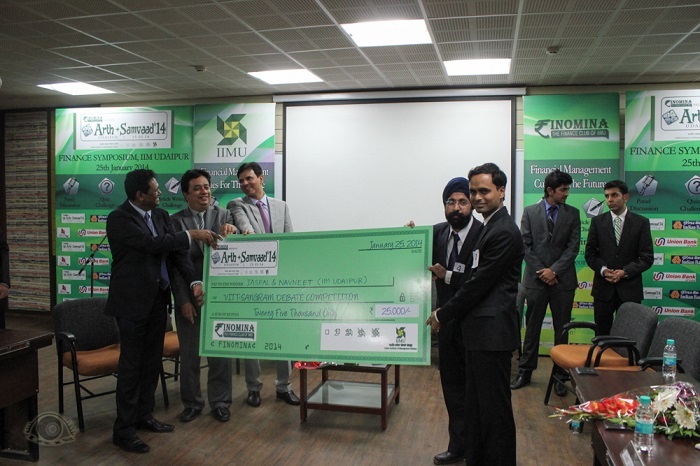 IIM Udaipur through various initiatives in the past has shown a deep commitment towards developing socially responsible managers and actively contributes in societal development. This programme in collaboration with the HBS Club of India is another major step taken by the institute in the same direction. 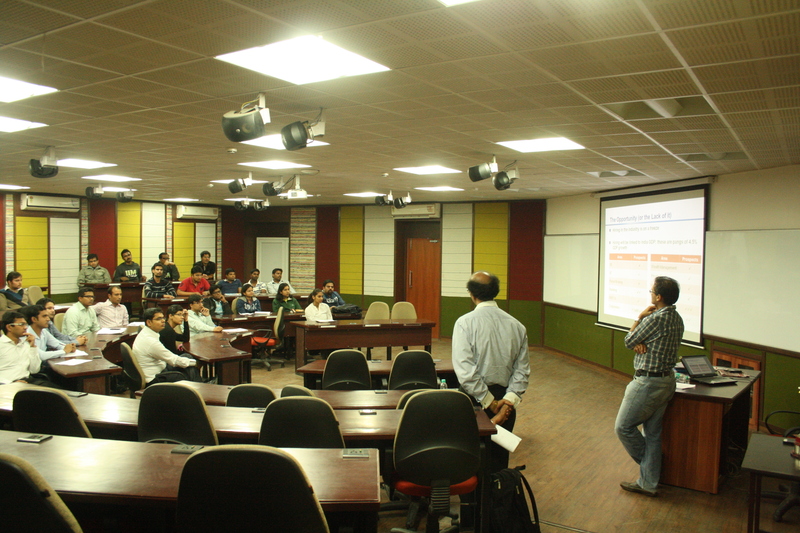 Meliorating the benchmark set by the “E-Commerce Excursus”, the Analytics Excursus was successfully organized on 5th December, 2013 in IIM Udaipur. 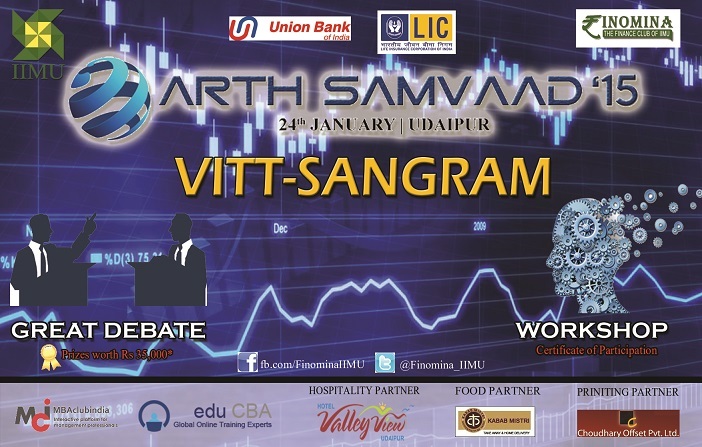 The Analytics Conclave-2013 is a part of the series of summits planned by the Indian Institute of Management Udaipur, under the banner”Excursus”. Focusing on the importance of extensive data getting generated every day and to take the useful insight from it which can be used for decision making, the theme for the event was decided as “Big Data- Big Advantage”. 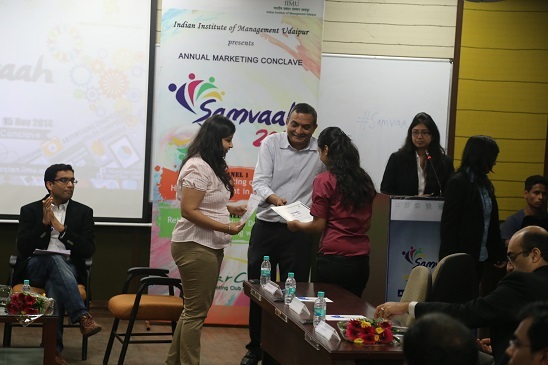 The Conclave encompassed a Presentation Challenge and two Panel Discussions. The Presentation Challenge comprised of a competition amongst student teams presenting the importance of Analytics and how well it has benefited the organizations. 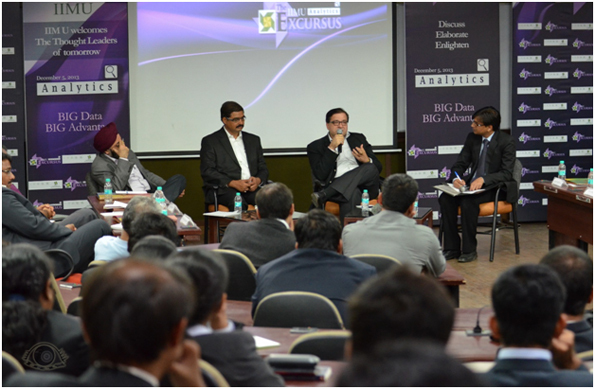 The panel discussions was a platform for industry leaders to share their expertise through engaging dialogues on two sub-themes within the umbrella theme of “Big data – Big Advantage”. The new era of data presents distinct opportunities for organizations but at a certain cost. In order to be successful one has to understand the major functional areas that attract applications of Big Data. Organizations have challenges varying from acquiring the relevant data to selling this idea in the Indian market. 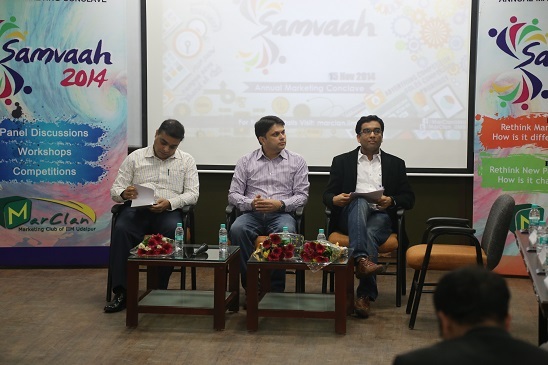 Mr. Roy Cherian, CEO & Founder of Marketelligent, Mr. Gaurav Vohra, Co-Founder of Jigsaw Academy and Mr. Dripto Mukhopadhyay, Vice President, Indicus Analytics shared their views on the first topic of the day “Big Data: Opportunities and Challenges”. The general view of the panel regarding MBA students and Big Data was that MBAs should be more concerned about the impact this has on the business and should be able to quantify the results. The opportunities brought about by Big Data have to be transformed into value by transforming the business practices. This technical revolution can be managed only by creating an enabling environment for using Big Data and transforming the internal business processes. Creating sustainable competitive advantage for companies depends on how well they transform the uses of Big Data. 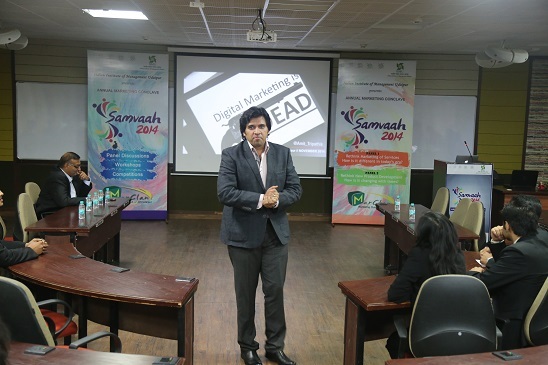 The next discussion witnessed business experts Mr. Ashit Panjwani, Executive Director at SAS Institute, Mr. Amar Saxena, Head of Analytics at RBS and Mr. Rajbir Singh, Global Head – Customer Centric Solutions at HCL. The panel mentioned that analytics deals with business problems and one should view the investment as a business investment and not as tech investment. They also said that one should be very clear with the questions that need to be answered, only then the analytics tools have meaning. The Analytics Excursus concluded with declaration of results for the presentation challenge competition followed by a vote of thanks. 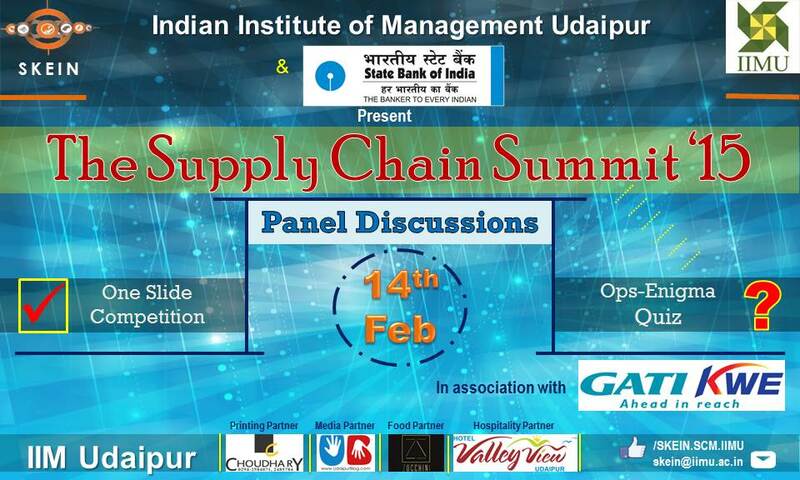 The panel discussion, the student presentations as well as the quality interaction with the industry leaders was an enriching experience for the students of IIM Udaipur.